I’ve had a strange relationship with burgundy foliage for the last five years. In 2010, I tried to buy a purple smoke bush (Cotinus coggygria) at my local Bunnings, only to be told, by a sixty-something man, that I would really struggle to find one anywhere, they were very unfashionable, after all. As the youngest person in the entire nursery, to say that I was indignant at having my taste challenged was a bit of an understatement. But, secretly, it did make me stop and think. Were they really unfashionable? Why would that be? Both the foliage and flowers have quite unique, and I thought stunning, textures. Was it the colour? It didn’t stop me long enough to prevent my stubbornness kicking in and make me determined to not only find a smoke bush, but to use it to create the most stunning composition in my new garden. But despite my best efforts at settling it into its new position, I never did really take to it. And since then I have not been able to look at burgundy foliage through the same eyes. 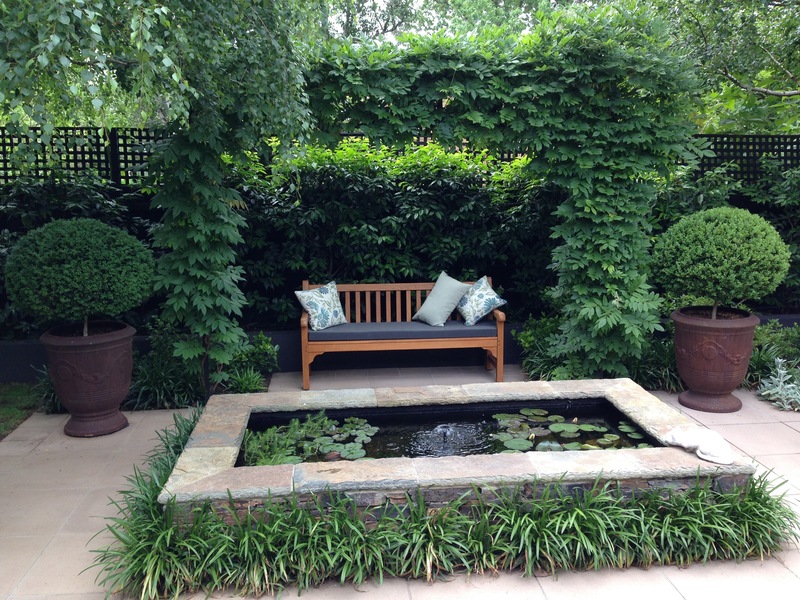 So when I visited a very burgundy garden in Melbourne recently, designed by Ros McCully, it was interesting to process my thoughts. There were many aspects to this garden that I loved, both burgundy and non-burgundy. I loved the subtle blend of Heuchera and Ajuga; the former picking out the burgundy tints of the Ajuga foliage. I also loved the Stachys growing with them; the foliage shapes, sizes and forms holding the composition together whilst the contrasting colours and textures provided a very pleasing effect. A perfect mix of covers for an area that needed very low planting. I also had distinct Acer envy. Here in Sydney, Japanese maples don’t do well. They may look fabulous for their first few weeks in spring but very quickly the sandy soil and often strong coastal winds combine to burn their leaf margins. The envy didn’t stop there. 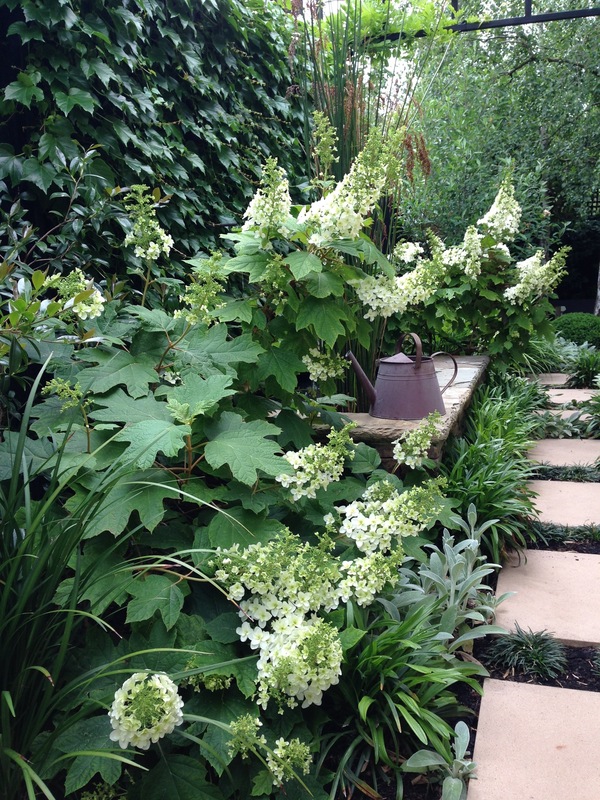 These hydrangea quercifolia were in immaculate condition. They will grow in Sydney – indeed they are native to the not dissimilar climate of Florida – although you don’t see them here very often. I suspect it is because they don’t look so good through winter – everyone in Sydney seems to want immaculate gardens for 12 months of the year. What a shame they miss out on so many great plants in so doing. I also adored this cosy seating area at the back of the garden. A shady bench under a natural canopy of leaves, a stocked pond giving movement and life and complete privacy all around – a perfect little oasis. And I loved the way this natural herb garden, behind the Stachys, blended into the garden; it was beautiful, connected to its surroundings and functional. It is rare to see edible plants so well integrated. And you could just imagine the views from inside the house. So much more stimulating than the common single-species hedge which most plant along narrow passageways. Some lovely photos, but I haven’t really answered the question of my thoughts on burgundy foliage today. This garden really did confirm that there genuinely is a place for every plant on the planet. It’s just that some work better than others in certain places and with some thought, a wider range can be used in each scenario. My preference with burgundy is to go subtle. I love this little scene with the fresh, red Acer foliage and the similarly coloured Salvia to its right. Nothing is too dominant. Because most leaves are green, if burgundy foliage is suddenly introduced in too ‘blocky’ a way, it just screams at you. For me, I want to take in the whole garden, to feel absorbed in the entire entity, not feel overly distracted by a single, prominent plant. ‘Contrast without dominance’ is my mantra. Whilst I adore the brickwork on this plinth, if I am being picky, for me the planting here is a little blocky. A little too obvious; the contrasts quite stark. The burgundy stone and Loropetalum tie together well; there are even tones of the Stachys in the stonework, but the green/yellow Liriope, for me, is one strong contrast too many for such a small area. Take one opposing colour away and the two remaining colours would be blissfully harmonious. I can see burgundy Loropetalum, burgundy-tinted Ajuga and grey Stachys looking absolutely stunning. I think flowers, with their transient nature, get away with much more contrast quite comfortably. I adore bursts of flowers of all colours, but somehow their green foliage always ties the different flowers together. It is more difficult to achieve this with highly contrasting foliage colours; you have to look very creatively to find connections to link it in with the rest of the garden. My usual preference is hence for its subtle use, rather than a formulaic, blocky use. 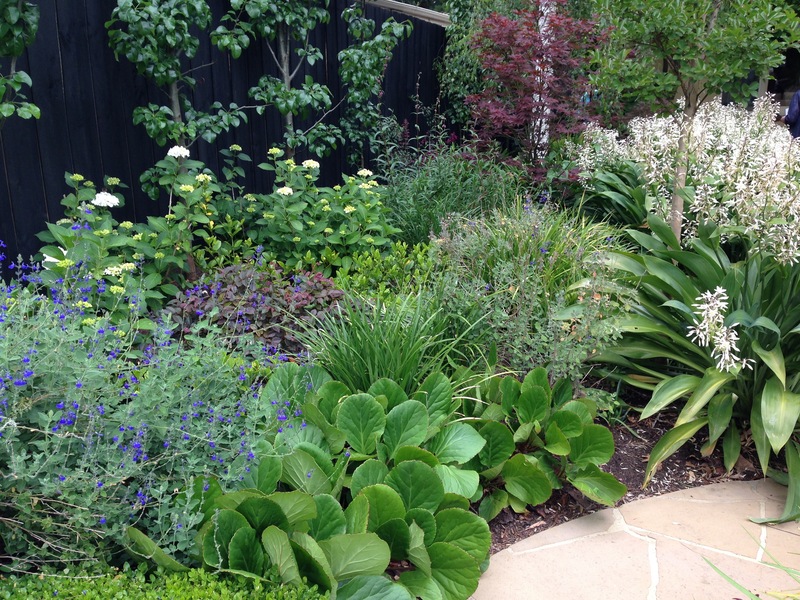 For me, repeater plants across a garden are best to recede, rather than act as the main attraction. Your mind subconsciously knows that some plants are repeated and hence the garden feels cohesive, but they don’t draw attention away from all that the garden has to offer. They are the foundations rather than the stars of the show. Burgundy can certainly be repeated, but my preference is to see it in the context of a variety of burgundy species and forms, such as the Acer, that has blurred margins, and the Ajuga, which straddles green and burgundy, so that they mingle with other plants reducing the blocky, overpowering, repetitious feel. 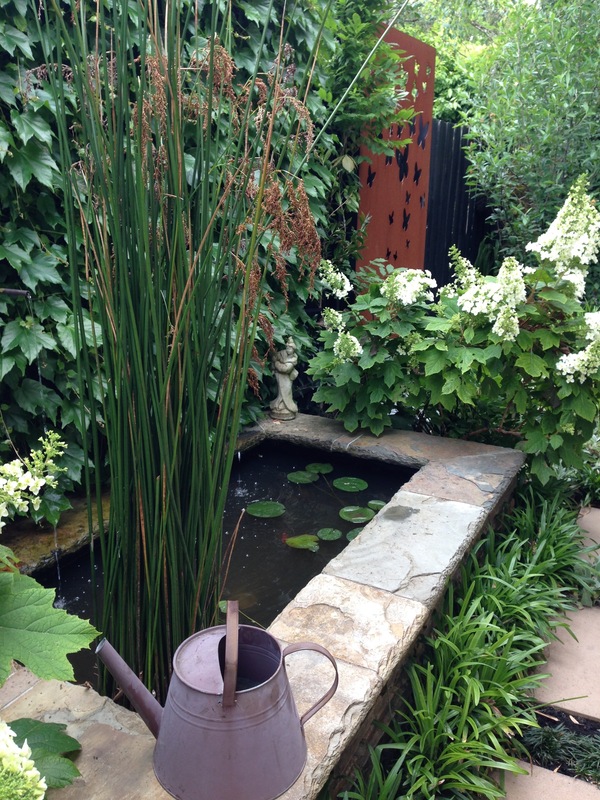 But you know, there are no right or wrong answers in garden design. Just preferences and trends. And until my Bergenia look as healthy as the ones below and I stop being corrected by Bunnings staff twice my age about what is trendy, perhaps I should not be too vocal on such things! 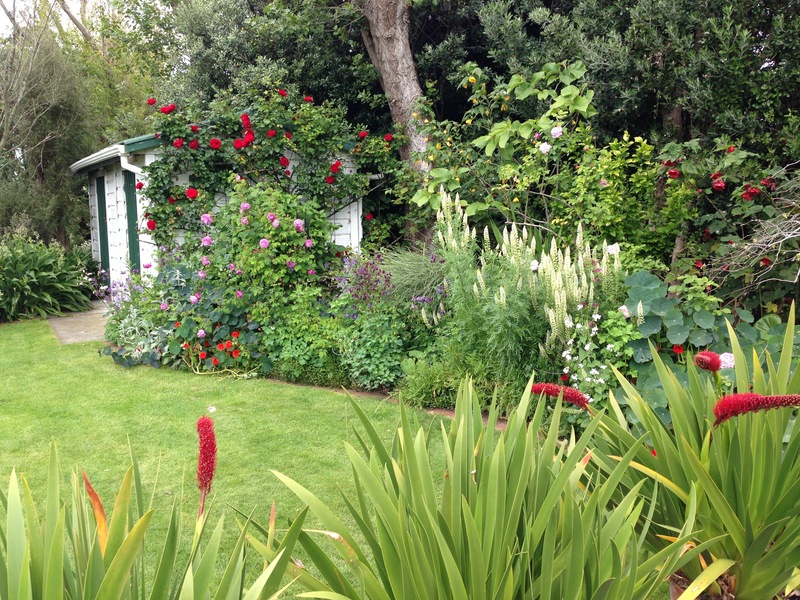 Subtle or (a tiny bit) blocky, there is no question that this is, indeed, a beautiful garden. Love burgundy foliage but it needs to tie in with colour echoes in flowers or other garden inclusions so it doesn’t look like a coloured blob and in heavy shade it disappears into nothingness. Positioning burgundy-leafed plants so you can see the sunlight shining through those dark red leaves is quite wonderful. If the spot is sheltered from wind, in Sydney I’d go for the similarly-coloured but more humidity friendly Euphorbia cotinifolia ahead of Cotinus. Although I have seen several splendid Cotinus in Sydney, many struggle. But I did see a burgundy Cotinus for sale in Bunnings at Belrose only a few weeks ago! Euphorbia cotinifolia is stunning. The Bunnings in question, though, was in Canberra, where smoke bush is one of the few things that positively thrives. In fact, I had one appear from nothing in my front garden, which must have survived 12 months of construction work, a good 30cm of construction debris and when I replaced the broken bricks with soil the roots somehow managed to send up new shoots, much to my surprise! Being an unusual breed, passionate gardeners (of any age) usually know what is on-trend (in my experience). However your experience with the 60 something Bunning’s employee sounds more like an excuse for not having the plant in stock, rather than a knowledge of trends. I love burgundy foliage and have Cotinus ‘Grace’ (from Lambley) and use other burgundy foliage in my garden too (not as cleverly as the above garden which is stunning, I am starting to think ‘small’ might be easier to achieve these results in I have never had a small garden to date). I love the planting around the stonework plinth (excepting the ‘yellow’ afterthought —- it seems like an afterthought). Which reminds me I must move a Carex ‘Edward Bowles (similar foliage) that I just plonked into a bed totally inappropriately just to get it going. 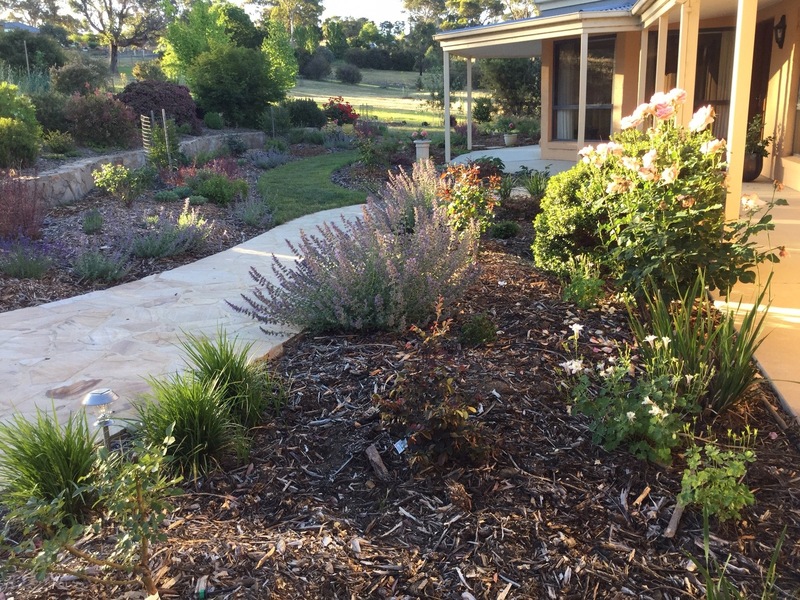 I am worried now though that my planting is too blocky, especially my new driveway garden (where I have also used burgundy as contrasts to other colours – I sort of had matrix planting in mind – oh dear! You do make me think Janna. 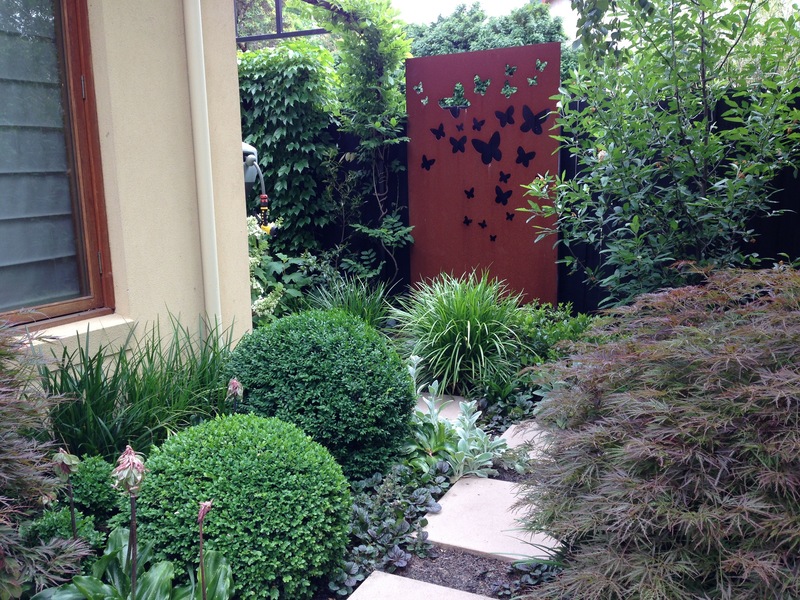 In fact I love this garden review and the garden – what clever design! 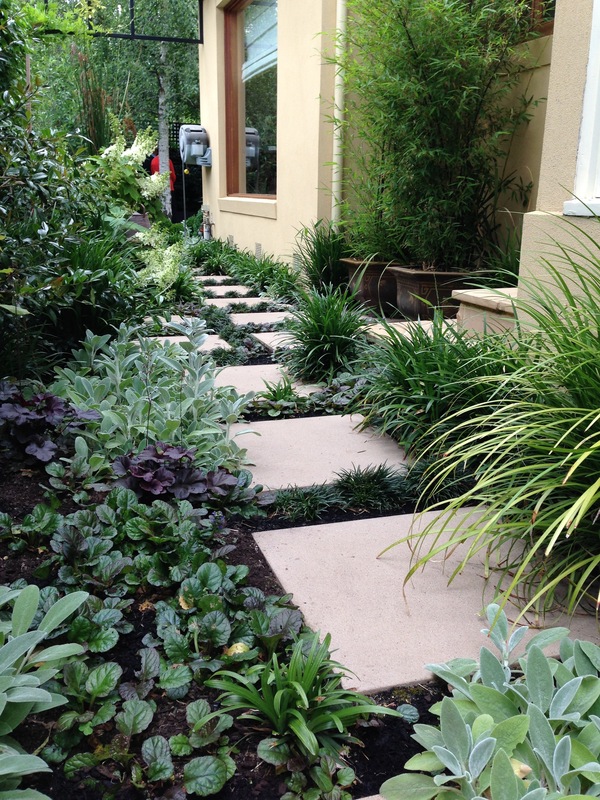 Throw some burgundy Salvia into the mix and I am sure your driveway will look lovely! I also think any blocks look less blocky if they are not all the same size. At least you do have the advantage of being able to repeat themes in different size clumps in your lovely large garden. It’s the one, one, one planting in a dominant colour that looks especially blocky to me. I’d love to swap you my small garden for your large one, but I fear it would totally overwhelm me. I’m never on top of this one as it is; I’m not sure how you do it. (Oh, and please don’t let any ramblings from me turn you off any aspect of your garden!). I agree that beautiful corner in the first photo is simply stunning! Your stunning photos always get my mind going to try and achieve that in my garden. Thanks again….. 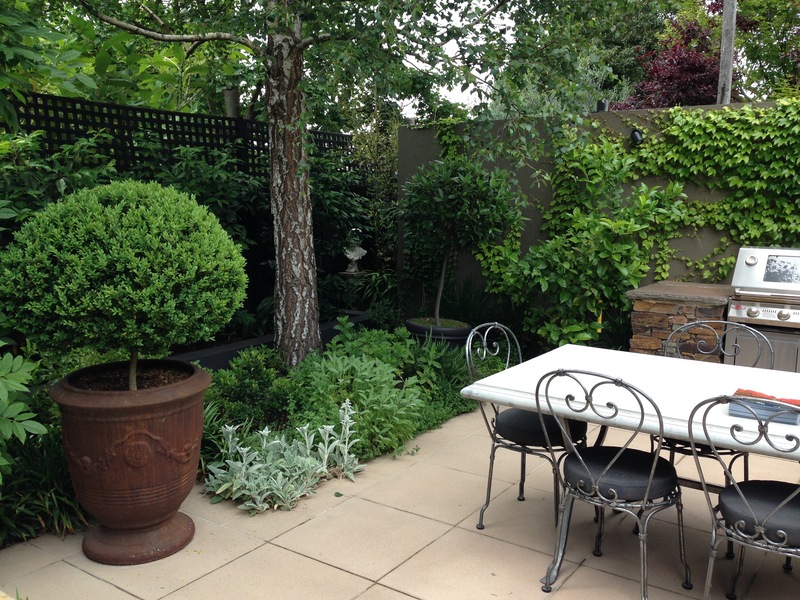 Yes, I love the contrast between the neat, round Buxus balls and the softer forms. Everything works so well together. Your garden will be just as stunning once it fills out; it’s really lovely already. I’m just so thrilled with the photos you sent me; you have worked so hard! I agree with Catherine burgundy looks great especially in a sunny garden, but somber in a darker small one. It’s a really good point to remember, isn’t it? Much nicer to have the light on it and then brighter foliage colours to enliven a darker area. I am another lover of burgundy in the garden, foliage or otherwise, thanks to a beautiful Prunus nigra my dad planted outside our kitchen window when I was about eight. Mum loved to grow Rhoeo in pots and I inherited her plants when she went into care many years ago. Numbers of both now grow happily for me in my Perth garden. Acalypha wilkesiana makes gorgeous big ruffled-leaf mounds and burgundy bromeliads add another texture. Other burgundy touches appear in various areas. Fashions come and go but so many of these ‘old fashioned’ plants were fantastic survivors. For me this makes them especially wonderful. I think your gardener in the “Throwing out the rule book” blog would agree. Janna, I very much enjoy your analytical posts. They make me stop and think about my gardening efforts and hence significantly add to my pleasure of gardening. How lovely to have plants that remind you of your childhood and parents, Suzanne. It is funny how memories from way back can really affect how you think of a plant. I remember a solitary, misplaced silver birch in my neighbours’ garden when I was little and it has taken me 30 odd years to start to like them again! The gardener from ‘Throwing out the rule book’ definitely approves of stoic plants – the longer I garden for the stronger I feel about planting things that actually want to be in your climate and soil. I’ve planted a few burgundy plants in my garden – most notably the ‘bloodgood’ Japanese maple, a copper beech and the ‘diablo’ nine-bark, and there are also many ruddy tones of the cut-leaf maples as well. I find them fun to use in the garden and these sorts of plants provide a welcome relief from the greens – in cool climates like mine they keep their colour, but in warm summer climates – or in shade which is needed to keep the leaves looking fresh – these do fade to a purple-green which can actually make them a really subtle contrast (as in the photo of the Melbourne garden). 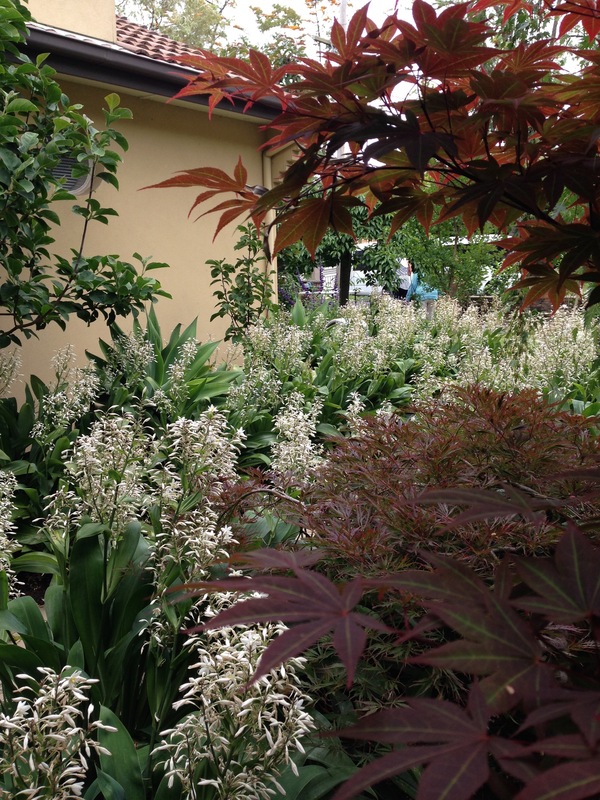 But finding ones for Sydney can be tricky…apart from cordylines, which are such an in your face purple contrast, Loropetalum and purple trad like it hot, and there are some natives like dodonea viscosa and the red-tinged lilly-pillies which will of course thrive in sandy soils. But I can’t believe the staff at bunnings told you they didn’t stock something because it was out of fashion! Good old Bunnings! I forgive them – the service there is usually outstanding. Yes, I adore the burgundy Dodonea and of course the deep red lilly pillies. Both are very easy to blend in with other plants, whilst providing much interest. 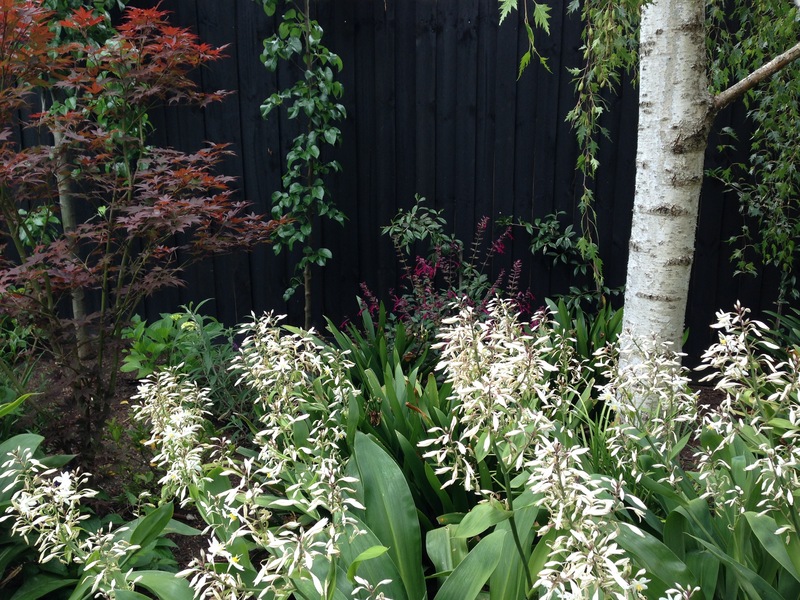 I particularly like the new Acmena ‘Cherry Surprise’. I definitely agree, some purples can be a bit overly ‘in your face’, particularly in gardens further south than the true tropics, where the really bright foliage colours look more apt to me. I adore C. ‘Forest Pansy’! I used it quite a bit in Canberra but it doesn’t seem to thrive so well in Sydney, so I steer away from it. 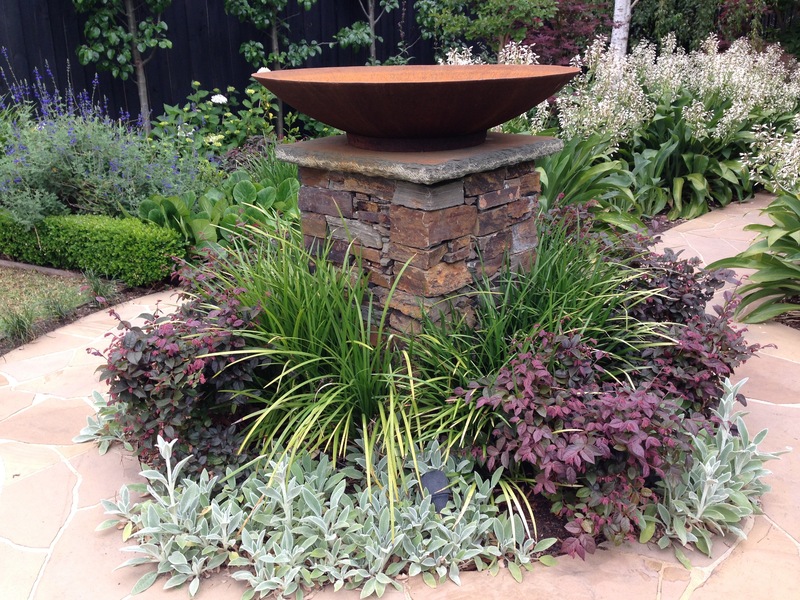 In Canberra we put a ‘grove’ of them surrounding a sunken fire pit in one garden – it looked gorgeous from spring to autumn, especially in the evening light. I also like C. ‘Avondale’ with its limey colourings. Can’t wait to see the results of your field trial – I suspect you will work wonders as always! You’ve made me think again about burgundy. I used to have a lot of it in my previous, rather more formal, garden but next to none here. 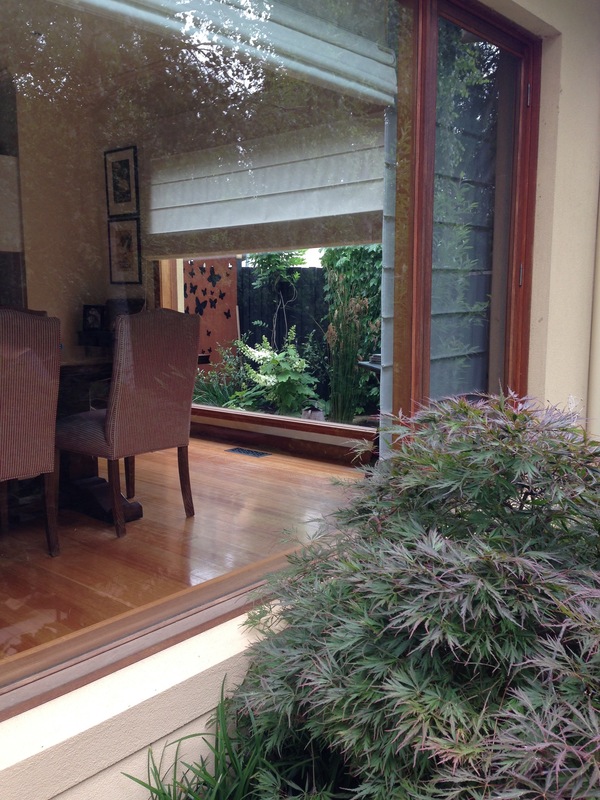 That is probably an omission and a case of finding plants that will look at home in a far more naturalistic setting. Heucheras don’t seem to grow here either, however much I might love them! Hi Jessica. Thanks for your comment. Yes, I think burgundy done well is absolutely breathtaking, but it does need thinking through or it can actually detract. I’ve failed recently with Heuchera, which was so disappointing; I found a gorgeous marbled one but the roots all got munched and one day it was the saddest, flattest thing you have ever seen! At least it makes us try new things instead of sticking with the same old favourites. wonderfully interesting post and comments. I guess fashion does matter, in the sense that large businesses like Bunnings make these decisions then we find it hard to source what we want. I go to Bunnings to browse occasionally but mostly I buy online from Diggers and Lambleys when I’m after non natives and get them through the post. I have a smoke bush and could do with some burgundy plants for echo and repetition and to unify the garden. Maybe euphorbias – I usually find plants from this family do well in my garden, and they seem to be available in different sizes and colours. Thanks, Sue. It’s great to get a trail of comments with everyone’s thoughts and ideas. Euphorbias do cope with a lot, don’t they? I hope to see some photos of some burgundy hints in your garden coming up!